On Monday afternoon the unpretentious surroundings of Woolwich town hall played host to remarkable scenes as Nepalese Maoist leader Prachanda addressed a 400-strong meeting. Prachanda is chairman of the Unified Communist Party of Nepal (Maoist), which won a majority in April 2008’s parliamentary elections after a 13-year guerrilla campaign to overthrow the monarchy: he was himself the first Prime Minister of the new republic, before ceding power this May. The rally was a fascinating spectacle, in particular insofar as it was marked by prolonged bouts of energetic shouting and interventions with a ‘revolutionist’ zeal rather at odds with the actions of Prachanda when in power. The music and speeches preceding Prachanda’s arrival and the fact that, following the apparently much-cherished tradition of the labour movement, the meeting began well over an hour late, only added to the sense of occasion. The vast majority of the audience were (seemingly) from the Nepalese community, and given the make-up of the meeting it was unsurprising that only small sections of the meeting were conducted in English, even though Prachanda can speak the language. A man sitting next to me very kindly translated. Prachanda’s repeated invocation of the Maoist doctrine of “people’s war” and the CPN(M)’s own guerrillaist history in his address were seemingly rather at odds with the strategy for power he outlined, which was very gradualist. Essentially his ideas boiled down to the argument that Nepal could not realistically go it alone in creating socialism (which is undoubtedly true) and therefore the maintenance of a broad alliance for multi-party democracy is the best option in laying the basis for the sort of political culture one would hope to see in future. Although he is an admirer of Stalin, this view was a direct rejection of the theory of ‘Socialism in One Country’, and he also argued that multi-party democracy was a necessary part of socialism. In practice, the CPN(M) has taken part in a cross-class alliance of all major parties opposed to the monarchy, thus reshaping the existing state apparatus to a limited degree, and for several months after the Constituent Assembly was established, headed a coalition government based on such forces. 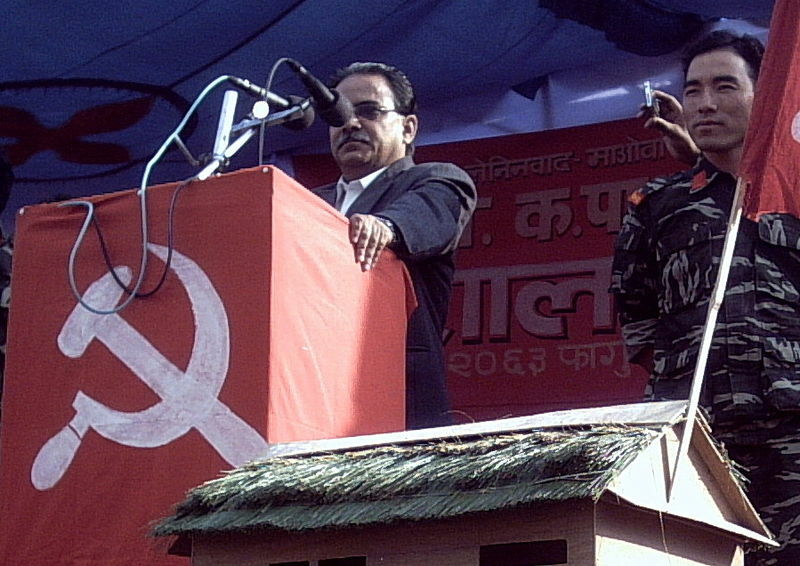 Prachanda was forced out of power after a dispute with certain sections of the military, who were unwilling to assimilate ‘ideological’ elements of the Maoist army. But Prachanda’s view that a communist party could control the levers of state under capitalism and gradually go about enacting socialism through reforms is a very unsophisticated understanding of the inertia of the state itself. Calls for greater democracy, allowing dissent and criticisms of voluntarist ideas of breakneck ‘socialist accumulation’ as occurred in the Great Leap Forward are without doubt less anti-working class than classical Maoism – but the CPN(M)’s claim to represent revolutionary politics applied to a ‘Nepalese context’ ring rather hollow. Of course all countries and all periods have their own particular characteristics and unique aspects, but the point of an analytical framework like Marxism is that it enables you to understand what things they still have in common. In fact, the experience of trying to hold together a ‘popular front’ (Trotskyists use this expression to mean unprincipled unity with pro-capitalist parties: in my view, using the state machine as your executive arm basically has the same implications) always creates a tendency for the revolutionaries to identify their own interests with those of the state apparatus into which they are assimilated. The state is not a classless, open ‘political space’ in which to operate: the machine has its own objectives and those who take over, rather than replace, the bourgeois state are taking responsibility for managing the existing system effectively. The gap between the current-day practice of the CPN(M) and its talk of communism is fake: they have no strategy for communism, only for the bourgeois state, since they attribute their being in power a phantom ‘transitional’ quality even though there is plainly no dynamic towards the state ‘withering away’. Getting rid of the royal family does not change the character of the bureaucracy and its many ties to business interests. Prachanda and his comrades cannot and could never have just played a waiting game, holding onto government and hoping that the situation of world capitalism would develop in their favour and allow steps towards socialism: in the here and now, being in power and propping up the bourgeois state forced them to make decisions like sending extra troops to participate in the carve-up in Afghanistan, crush strikes (for all the talk of democracy), and ultimately, simply capitulating in the face of pressure from upstart generals. While Maoism is experiencing somewhat of a resurgence both on the subcontinent – given the strength of the Naxalites in India as well as the Nepalese left – and in academia, with the likes of Alain Badiou and now Slavoj Zizek willing to stand up for Mao’s heritage, there is not really much cause to re-evaluate its ideas in the wake of Prachanda’s experience in power. The CPN(M) are the post-modern, post-‘end of history’, post-‘There Is No Alternative’ brand of Maoism – they think transformative change is impossible, but seek ministerial positions anyway in the name of a cause they have no plans to move towards. While academic Marxists in the west may like to eulogise Mao’s “daring to act” and “willingness to suspend the existing ideological co-ordinates”, the reality of these movements today is that although they are sometimes superficially ‘militant’ – in the sense of being dogmatic, terroristic or repressive – their identification with the existing state apparatus means they are at the same time unwilling to bring about any real changes in social relations. Whether Maoist, Stalinist or Trotskyist, a party that claims to be the representatives of the working class who then take over the administration of the state apparatus, actually become representatives of that apparatus because that is their power base. In that sense, it is not for us to give ‘advice’ to the Nepalese Maoists: their conception of communism is utterly different from our own, and for that reason the strategy of parliamentary manoeuvre they have adopted is way off our radar. Their point of departure is totally wrong: building a movement from below on democratic lines, whether slower or faster in bringing political power, would be an entirely different course of development to theirs. But the experience of Prachanda as Prime Minister has much to teach the left about the vacuous nature of defining alliances against a perceived ‘common enemy’ or coalition-building with no independent objectives; and the impossibility of managing the state in the interests of the working class. Now that he is out of power, he comes to London, to speak to the radicals. Very interesting I agree, but also a totally utopian critique. Right now, even if the Nepalese Maoists had the wit to discover the revolutionary principles of “workers’ self management” then they could not possibly implement them – although I realize that you would counter that these principles precisely cannot be implemented by the state. The “withering of the state” at this stage would mean nothing less than the re-instatement of the monarchy. You are totally right to criticize Prachanda for his wet lack of resolve in the face of adversity; but you cannot go on to have your cake and eat it, so to speak. Essentially the situation does call for an either/or judgement. Either we suppose that the long struggle to dislodge the monarchy is a good in itself (and I would say so), or we permit the Maoists to be considered a failure for not bringing about the form of communism which would be impossible to coincide with the deposition of the monarchy. I think this also flags up a number of the troubling positions of the Commune on such issues as socialism in Cuba, China etc. And whilst I think as a “regulative ideal” – or strategy – building a separation with so-called “really existing socialism” is probably the way forward, acting as political actors surely does require us to take positions sometimes that don’t refer to some unrealized utopia, but rather to real oppositions in the here and now. For all Cuba’s Stalinist politics and state repression, would it still be better as a playground state of the wealthy of the United States? Would Latin America be better off if Castro’s regime had collapsed? Would the prospects for socialism throughout the world be improved? The same could be said of Chavez. Although he is an authoritarian populist without a doubt, he has decisively changed the terms of the debate in Venezuela and Latin America. Now elite opposition is forced to argue on the grounds that he has done *too little* to alleviate poverty, whereas before poverty was not even an issue worth debating in respectable politics! So I agree that we should remain critical of political groups claiming to enact communism (the 20th century and large communist groups in South Africa etc. tell us well how hollow many of these claims are). But at the same time, I think we should also be careful that this relentless critique does not become fodder for the kind of reactionary middle-of-the-road liberalism that can quite easily co-opt these critiques, even if they share non of or principles. I think the academic post-Maoists who attribute a certain significance to Mao would probably no longer do so on based on his personality cult, “iron will,” or some such silliness. But they probably do have a point, that for a narrow period during the Cultural Revolution – when the power of the state was essentially dissolved during Mao’s faction power struggle in the CCP – a form of stateless, grass roots militancy did flourish. For Badiou, the tragedy (and importance) of Maoism is precisely that it shows the limits of trying to bring about communism within the state apparatus, even in the final reckoning of the Cultural Revolution, where the state persisted as a mere skeleton to preserve the running of the basic functions. So for Badiou, the Cultural Revolution (at least up until the Shanghai Commune) was a huge experiment in whether communism can arise during the presence of a minimum of the state apparatus. There are probably some interesting lessons to be learnt there, even if we (rightly) consider Maoism itself as a paltry and ridiculous idea. The article is indeed somewhat of a utopian critique, but placing naive demands on the CPN(M) to do things totally out of its character (such as enacting some sort of industrial democracy) hardly seems a worthwhile alternative. The SWP recently ran an article called something like “How Labour should fight the recession”: pretty arid, since it is not Labour who we want to be fighting the recession! The point of talking about Prachanda’s bad decisions (at the same time as arguing that real change cannot operate at the level of state anyway) is that they help demonstrate that it is not a viable alternative strategy. We are not influencing events in Nepal: but what can we learn from them? The question is whether you see Prachanda (or Mao, or Stalin) as a ‘misguided comrade’ with whom we have basically similar objectives but whose tactics are likely to lead to defeat (actually, I think there is almost too much of that in my article) or whether you recognise that his idea of socialism is so radically different from our own that it is better to treat his theories with the same total lack of sympathy you would a Peronist, a Liberal, or whatever. The means he advocates and the ‘ends’ it would produce are the same thing. As his collapse in May shows, and any number of purported socialist governments kicked out by the army, it does not work even on its own terms. Certainly Hugo Chávez has opened up a certain degree of political ‘space’ in Venezuela. But that is not only because he calls himself a socialist: the Portuguese army and the Peruvian colonels did this too by confronting other elements of the ruling class – so too, in a way, can liberals. What you say about the debate over poverty in Venezuela could also be said about discussion of healthcare reform under Barack Obama. Sometimes in elections we have no practical choice (Chirac vs. Le Pen; Obama vs. McCain) open to us other than those presented by bourgeois politics. But the question then is whether you throw yourself into backing the least-worst bad option and building support the more benevolent oppressor, or if you seek to help the (always continuing) struggle to build an assertive workers’ movement which represents the best chance of forcing ameliorations in the here and now, and which also has the – ultimate, maybe far away – potential to radically change everything. The further problem with the first course of argument, as under a number of ‘left’ governments is that you always then get the idea that the working class should stay silent and take a hit in the interests of keeping the less-bad government in power. Like Allende who continually argued for calm, disarming the workers and putting the generals in his cabinet… who then took the opportunity to murder him and smash the working class’s organisations. In Nepal you would clearly demand the abolition of the monarchy, as would Maoists in that they are anti-feudalists, but you would not stop your struggle at the point whereby a bourgeois republic had crystallised, as the CPN(M) clearly think possible. Revolutions and the class struggle never stop: you cannot just dream up a half-way house (still under capitalism) and hope to keep a lid on all the contradictions and class antagonisms. In their role of guardians of this state machine, the CPN(M) announced in January that it wanted to create Special Economic Zones where strikes would be banned. That does not suggest to me that they are likely or willing to foster the kind of mass worker mobilisation necessary to fight attacks and indeed capitalism itself. I do not think middle-of-the-road liberals care much about that: but for me the confidence and self-reliance of the working class is 100% the point: I totally support those workers who want to organise against that government, even without knowing anything else about their politics, since the only way of building a better communist movement in Nepal is for them to trust in their own strength and not have to hope for benevolence on his part. Not really, healthcare has been a persistent cause of the liberal-left for a long time. Obama’s struggles now merely repeat (almost as if in a time warp) the early Clinton years. On the other hand, before Chavez there simply was no cause for the poor etc. in Venezuela, once you exclude the small and ineffective left groups in the county. Thus a dose of political realism should tell us that Chavez’s rise is probably on average a positive development, even if there are aspects of his regime which are appalling and we should rightly take him to task for. To be clear I am totally against the kind of uncritical cheerleading some elements of the Left indulge in when it comes to figures like Chavez, but still it seems to me that ultra-critical dismissals of trend/possibilities in the world is an equal cop-out. The kind of communism we advocate has literally no-chance in a world that lacks even flawed opposition (even on the rhetorical level) to global capitalism and imperialism provided by people like Chavez. In my opinion he is a necessary evil, much like capitalism itself, if we ever want to see communism on this earth. So, yes, if we treat Chavez as the name for the political movement in Venezuela (not simply the man) I would say that they do represent “misguided comrades” for whom if the alternative manifest itself would be the ones to realise a more progressive leftism. In the same vein, the source of our debate comes down the question of consolidating gains versus pushing forward. Most of the time I would instinctively favour your approach, which is to relentlessly push forward and – to talk in Furedese – “take the risk!” However, there are some situations where this simply will not be possible. If say, the Nepalese Maoists were to actively encourage the withering of the state (they have already in many ways done this with regards to their own power) then pretty quickly the monarchists would return to power. So we return to the Trotskyist versus anarchist-communist dichotomy. For Leninists and Trotskyists the flash in the pan of state power/Terror is necessary to consolidate gains and stop a reversion to the status quo, whereas for you the necessity of the flash in the pan already signals that the moment of potential to do things properly has already been irrevocably lost. There are no easy answers here I admit. In many ways, the “fanatical” line taken by the Commune is the most appealing to me, but I can’t help feeling that it needs to supplemented (watered down you might say) with a bit of political realism. seams, that Prachanda is sorting out important family issues in London: http://www.telegraphnepal.com/news_det.php?news_id=6004 … the main reason for the strength of maoist groups in South Asia is not their ideology but that they do address some of the issues raised by poor peasants, Dalits, Adivasis, etc., that they defend them against landholders, police, etc.